I’ve grouped these sites by age because that’s exactly the kind of information I was looking for myself, and couldn’t find. The grouping is based on how easy it is for children to participate in the activity, or to access and ‘read’ the information at their age. But don’t let the groupings hold you back – take a look for yourself to see what would best suit the children that you’re playing and learning with. Have you found any fun places to learn about weather online? Please share! How’s your long weekend been? As you’re probably in a chocolate haze, and recovering from all those family get togethers, I thought I’d share a relaxed play idea. Fridge play– duh. Magnets go on the fridge, right? Put them high, put them low, move them around, have them chat to each other… see where your toddler takes the play. You could also use a magnetic easel or board. Who am I? 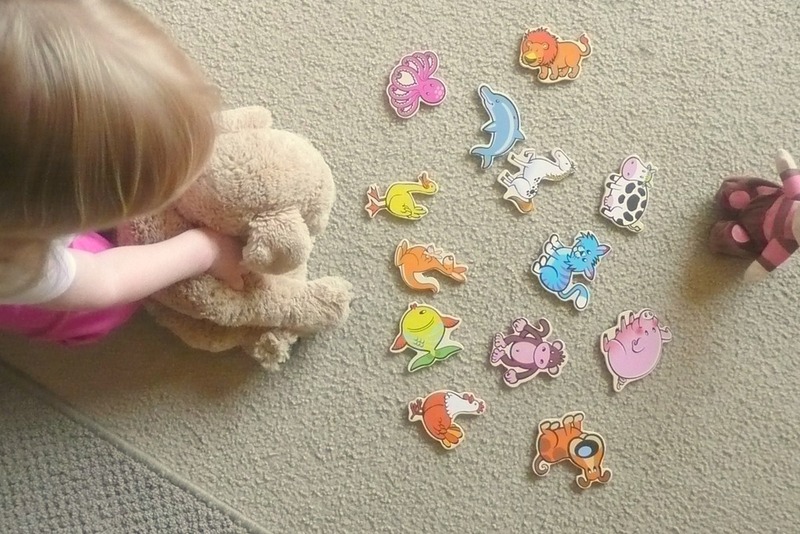 Take turns to say an animal noise and have the other player(s) find the magnet that matches your sound. eg. “I’m thinking of an animal that says “moo”. Which animal is it?” Start with only a few animals to choose from, then add more as your kiddo gets more confident. Doll house play– Of course the animals can come on over to the doll house! Turn the doll house into a zoo. Or maybe the animals are housemates. Animal Hunt – hide the animals around the house and give clues for finding them. A magnifying glass and a basket for collecting with make this hunt oh-so-much fun. Sand play– rock some animal magnet fun in the sun with a sand tray or sand pit. Use branches, leaves, twigs and seeds to create a home for the animal friends. Sorting– how many different ways you can sort the animals. Colours, sizes, spots, stripes. Keep it simple with toddlers. Find out how they want to sort them. Free play – the most important option! Don’t feel like you always have to lead the play – children are the experts. They need time and space to use their imagination. Follow their lead, join in, or give them some independent play time, which is an important skill too. Put your feet up and have a cuppa! Bubs will get a kick out of exploring these safe-for-baby magnets and sliding them around on a magnetic surface. Make a visual board for bubs next to the change table – pop a magnetic board on the wall and stick some animals magnets on it. Have a natter about the different animals and the sounds they make, or do your best Old Macdonald rendition. 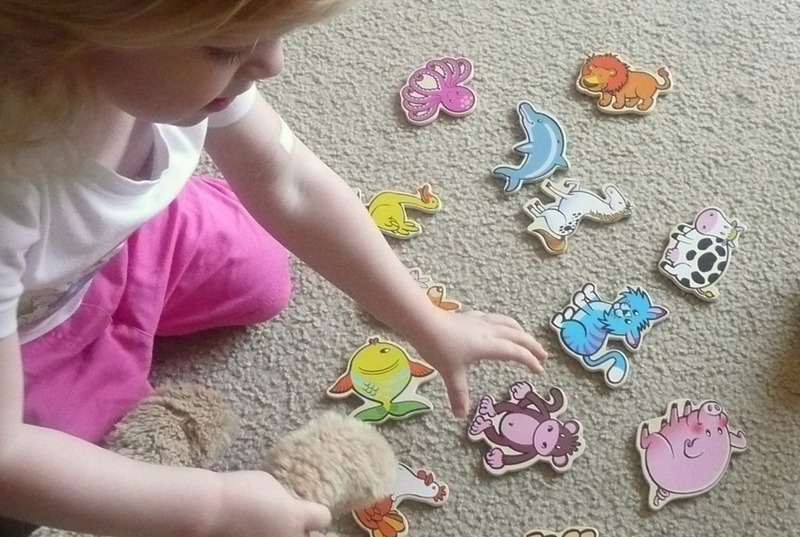 Get two sets of inexpensive magnets to create your own matching game. Kick the sorting game up a notch by making the categories more complicated – ask them to put together all the animals that live underwater, or all the animals that have fur. Use the animals to make up stories – take turns to pick an animal and say “one day there lived a insert-name-of-animal who loved to make-up-something-funny”, eg. One day there lived a horse who loved to eat ice cream. If you’re keen you can get dramatic and act out the stories too. Using two sets again you could pop a selection of matching magnets face down on the floor and play ‘memory’. Get really tricky by sorting the animals using the sounds in their names – all the animals that start with ‘a’ or all the animals that have an ‘a’ sound in the middle. What about organising them into alphabetical order? Use an alphabet chart to help or sing the ABC song. Got something to say? Go on, you know what to do.